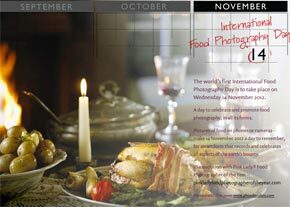 The world’s first International Food Photography Day is to take place on Wednesday 14 November 2012 – a day to celebrate food photography in all its tasty and delicious glory. We are encouraging everyone to celebrate the art of food photography by taking a snap of their mid morning apple, a sandwich from their lunchbox, a takeaway curry or supper at a friend’s house. We hope you will be inspired to snap your crackle and pop at the breakfast table, get zoomy on your halloumi at lunch or simply shoot a winner at dinner – wherever you are with food on Wednesday 14 November, take a picture and create your own food masterpiece. Pictures on phones or cameras, whatever comes to hand, make this a day to remember, for an art form that has been around, astonishingly, for more than 150 years, recording and celebrating all aspects of the earth’s bounty. JOIN OVER 99,969 and receive weekly updates!